Easter Chocolate Shopping, you’d better get cracking! Episode two of my Easter Chocolate Shopping tips. For those of you who read the last post and ordered your Easter chocolates already, well done. For those of you who made it to The Chocolate Festival, I have no doubt you had a ball, and left with all your chocolate needs met. 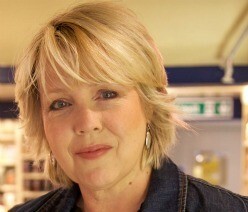 But for all those last minute shoppers I am back with an extra post. Here are some more tips on delectable chocolate treats to ensure the Easter bunny doesn’t disappoint. Easter offerings got particularly elegant this year. 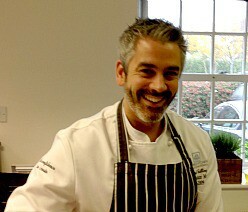 And William Curley, the award winning fine chocolatier, would never disappoint on either appearance or taste. 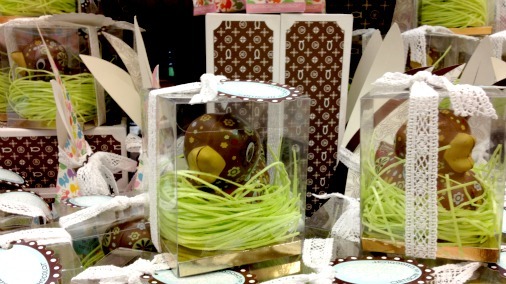 The eggs come in three sizes and are filled with yummy things such as cinder toffee, confit fruit dipped in dark chocolate, caramelised nuts, caramels, and truffles. Prices start at £30. William uses only Amedei chocolate from Italy, and his refined and delicious work is worth every penny. It is not going to surprise anyone to know that one of my stand out favourite offerings this year is from Paul A Young. He has taken his sea salted caramel, which won the only gold award in the world at last October’s finals of The International Chocolate Award and made it spectacularly larger. 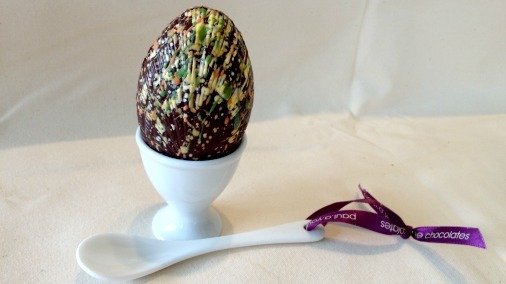 Finally, in this beautiful speckle-painted egg complete with its own porcelain egg cup and spoon, a salted caramel chocolate from Paul big enough not to leave me panting for more. Mind you, it didn’t take long for the craving to reassert itself! 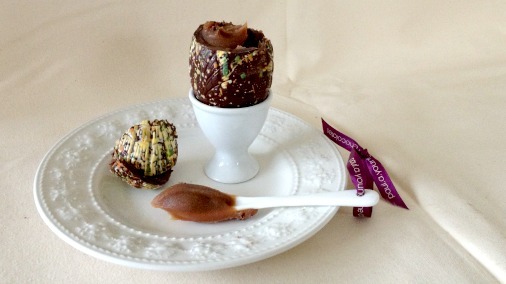 Paul A Young, salted caramel dark chocolate egg with its own egg cup and spoon. As you can see from these photos, the shell is a thick dark chocolate, a lovely fruity 64% Madagascan, which also has the deep smoky notes needed to stand up to the sweet caramel and balance it well. The caramel itself is the best there is, rich, smooth, deep and taken to the edge of caramelisation. It is perfectly salted with that bold but deft slight of hand that is such a strength of Paul’s. Heaven in an egg cup! What can I say, I already had one and I want another! Bliss! The phenomenal success of Hotel Chocolat, who have managed to populate the high street with a truly stylish and articulate range of products is down to one thing, the passion of its founders Angus Thirlwell and Peter Harris. For my part I am delighted that a company that has such wide reach prioritises a real communication with the customer. Their full range demonstrates chocolate’s many possibilities, far from the conventional high street offering, and crucially there is a highly visible story about where chocolate comes from and how it is made. With their Rabot Estate plantation they have ensured they control every aspect of this glorious process. 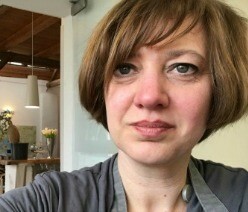 I was lucky enough to go to their Easter party at the flagship London cafe Roast and Conch. There it is possible to watch beans being processed, and eat and drink a range of delicious treats made with cacao and chocolate. A proper Easter stash, thanks to the Hotel Chocolat bunny. 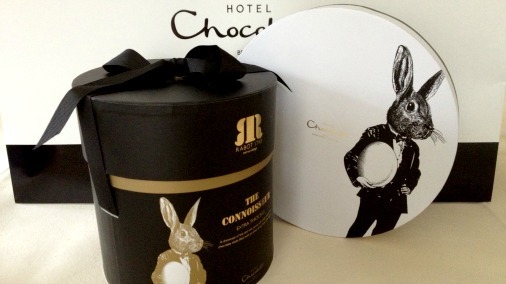 The Hotel Chocolat story for this Easter is particularly inventive and involving. It takes the character of Beau Bunny, wonderfully realised by Creative Director Timothy Rennie and drawn by artist Neal Murran with exceptional draughtsmanship. It then sends him on a journey of wit and elegance in his quest to bring you your Easter chocolates. You can watch Beau’s journey around Europe online, and take a piece of the quirky and romantic illustration home with you on one of the stunning boxes. I particularly loved the classic circular box, reinvented in cool white with its off centre artwork, and the black ‘hat’ box holding the dark Rabot Estate Egg. (Both in the lead picture for this piece). The Rabot Estate egg is also the chocolate that excites me most of the wealth of things they have on offer, as it is a single origin dark chocolate made purely from their plantation in St Lucia. 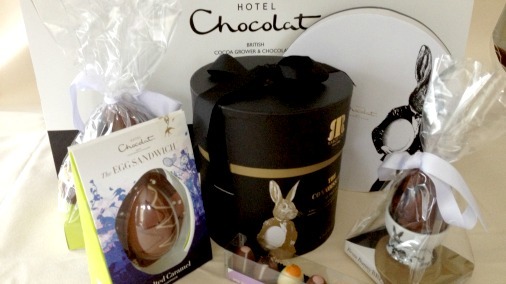 If you get really lucky, instead of bringing you an egg the bunny might bring you tickets to stay at the real Hotel Chocolat, in St Lucia, where the Rabot Estate plantation is! 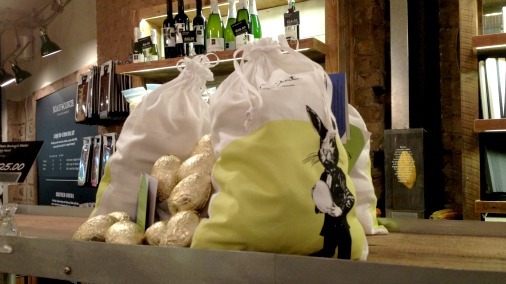 All kinds of Easter goodies at Hotel Chocolat flagship Roast & Conch. 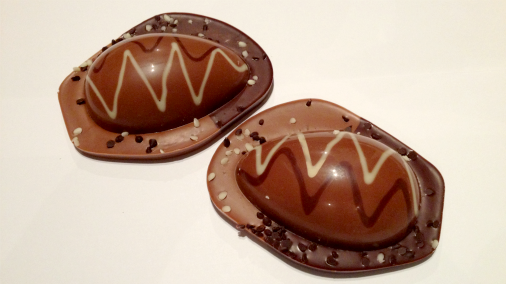 Hotel Chocolat also rethinks the more obviously crowd-pleasing chocolates, with this Salted Caramel ‘Egg Sandwich’. 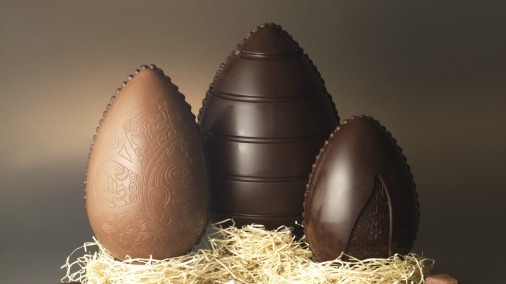 It is two sides, each with an egg shape and base, made of 33% caramel chocolate and 50% milk chocolate, decorated with dark and white chocolate chips and swirls. The 33% chocolate is very creamy and has a good chocolate flavour with lots of caramel. The 50% has a similar but deeper flavour, a darker caramel comes to mind. The texture is the star here, as the whole is peppered with shards of caramel that give crunch, and little bursts of flavour. The relatively high percentages and edge of salt prevent that excessive sweetness that so many Easter eggs have. Crucially there are no off notes or hidden nasties, and it is pretty much guaranteed to please the kids. Hotel Chocolat rethinks the Egg Sandwich. Artisan du Chocolat is always reliable for tasty things, well made and with interesting flavours. It has a wide range of goodies specially for Easter which all look stunning. Their chicks are impossibly chic, some looking very much the designer purchase, others with a light airbrush coating of yellow (white chocolate) baby chick fuzz. 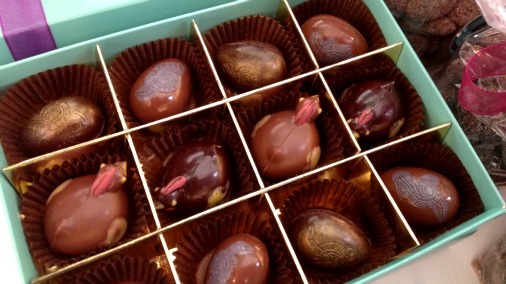 Of the things I tried I particularly liked a Marc de Champagne ganache reworked for the season into a gold egg. It was exceptionally creamy and had a nice boozy warmth that was very welcome at The Chocolate Festival last weekend in the freezing cold! 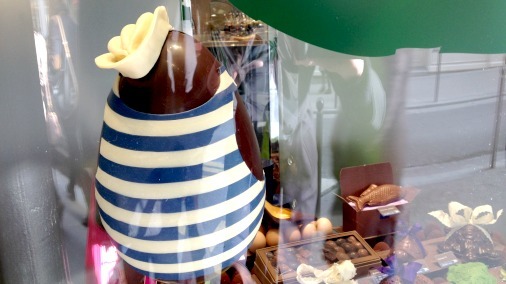 Chic choc chicks at Artisan du Chocolat. Also on the South Bank I liked these adorable hens made by Kokopelli’s in North London. They use only Valrhona chocolate so you know they will taste gorgeous too. These eggs and hens from Kokopelli's caught my eye. And one final thing, just to show you what they are doing over the channel. I know it is unlikely you are going to Paris and back before Easter, but just in case you are there already, and because I thought this would bring you a smile. This totally outrageous creation is by French chocolate genius Jean Paul Hevin. It is called Oeuf Maillot, literal translation being swimsuit egg. Do forgive the appalling photograph through the shop window on the Rue Vavin, but I could not resist him with his nautical chic! 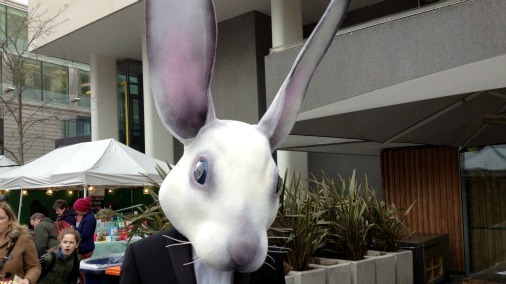 Happy Easter, and I hope you have a generous and well informed Easter Bunny round your way. If not you could always leave your screen casually but cunningly lying about with my articles visible. Last weeks easter shopping tips.